Anyone who has been to this country (and even some of those who haven't) will no doubt be skeptical about the words "Vietnam" and "road trip" in the same sentence. It's true: In a city like Hanoi, the traffic can make you freeze up like an opossum. But outside of the cities, where vehicles are few and far between, the scenery is unforgettable, the culture vibrant, and the road trip experience unparalleled. 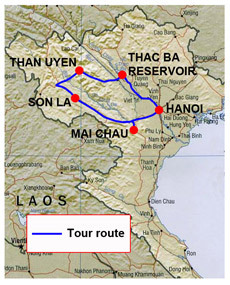 The Northwest Loop begins in Hanoi. If you're going to tackle this route in a car or truck, it's best to get a 4WD. Most of the route is sealed, but heavy rains can occasionally wash small rocks and debris onto the road in the mountains. And speaking of rain, since you're in the mountains all bets are off when it comes to the weather. It's true that Vietnam's dry season runs from October until April, but if you try this during "rainy" season in the summer months you can still get away with it. And remember, as you get higher up, the temperature will drop, so you may use both the A/C and the heater in the same trip. But be warned, the small twisty roads were drawn into the hills for the pleasure (and ease) of two-wheeled travel. The trip can be done on a 125 cc semi-automatic "motoscooter," which are incredibly easy for even non-riders to get a handle on quickly. You can rent one in Hanoi for less than $10 a day from an outfitter like Flamingo Travel, who provides helpful English-language service. Flamingo also provides guided tours for those who don't want to tackle the country alone. 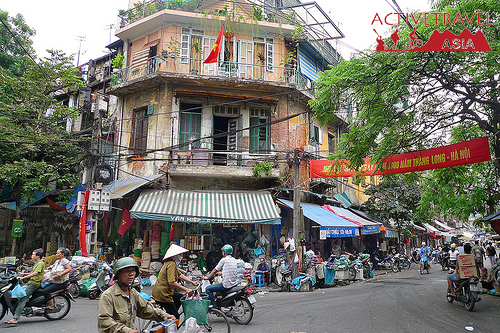 After you've explored Hanoi's bustling Old Quarter (the Essence Hanoi is a great boutique hotel option) and filled up on Hanoi's legendary street food, it's time to brave the traffic on the highway from hell out of the city. This is a straight-shot, get-it-over-with drive to the first stopover. Look on the bright side: You will never again complain about traffic back home. Just under 30 miles southwest of Hanoi on Highway 6, you'll have the chance to turn left onto a skinny two-lane secondary road. Take it! This is what you've come for. The road weaves its way through rice terraces, bypassing the truck-heavy main drag. 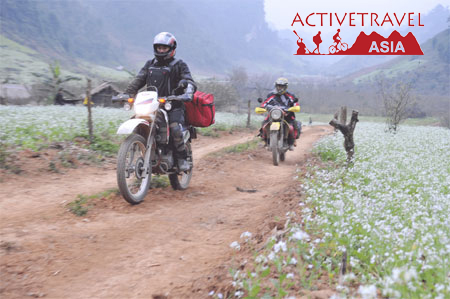 You'll meet up with H6 again soon enough, which you'll take the rest of the way to Mai Chau. Once in Mai Chau, take a day or two to explore the surrounding countryside, which is home to many of the White Tai ethnic minority. The lush, rice paddy-filled valley is a world away from the noise of Hanoi, the horns and hawker shouts replaced with gurgling irrigation rustling leaves. Here you'll find one of the best accommodation options in northern Vietnam: the terrific Mai Chau Lodge. When you leave Mai Chau, you will follow weaving valley roads and mountain switchbacks up H6 to Son La. The journey is not far, but you will stop so frequently to take in the view, so budget extra time. A good idea is to break up the day with pit stops in the small towns you'll find on the way, where you can refill with Vietnamese iced coffee or pho. After Son La, you can head directly to the big city in the north, Sapa, but you'd be wise to head to Dien Bien Phu on the QL279 turnoff instead, where you can view the site of one of the most decisive and game-changing military victories in modern history. DBP is where the French rule of Vietnam came to an ignominious end—think Custer's Last Stand in Indochina. Walk around Hill A-1, and then visit the ranks of unmarked graves in the war cemeteries. It's a grim reminder of the war-torn history of the beautiful surroundings. On to Sapa, the center of northern Vietnam. A former French hill station, the town overlooks a valley of waterfalls and rice paddies, and frequently finds itself in puffy white fog as clouds roll into the town center. This is great place for trekking and mountain biking. Trekking Sapa leads multi-day tours around the area, showing off the natural beauty and the culture of the local Hmong hill tribes. For a place to stay, try Thai Binh Sapa. It will take a solid day to drive back to Hanoi from Sapa, so it's wise to break up the trip into two pieces, sleeping the LaVieVuLinh ecolodge homestay near Thac Ba Lake on the way back. If you have time, though, spend an extra couple of days and head east to Ba Be National Park. This remarkable area is up for UNESCO status as a World Heritage Site, but is seldom visited because it is tough to access using public transportation. The park plays host to countless species of fauna, including bears, tigers, and the king cobra. Stay in one of the stilt-house homestays in Pac Ngoi village, which cozies up to the shores of Ba Be Lake, the freshwater centerpiece of the park. 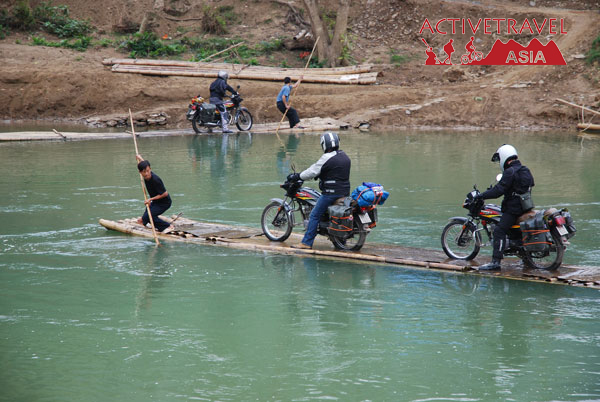 ACTIVETRAVEL ASIA would like recommend Motorcycling West to East Northern Vietnam tour.This motorcycling trip reveals a different route to get from Son La to Thac Ba. 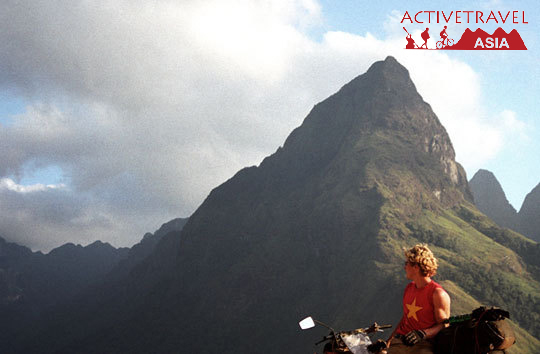 It offers adventurous riders stunning scenery and great tribal culture exploration. The route is not yet popular thus you do not share the roads with other tourist but mainly share the roads with the locals who are on their Honda to the farm. The perfect itinerary and the support crew ensure you get the most out of the trip in terms of comfort, enjoyment and adventure.